If your workbook contains one or more VBA Macros, you must save the file with an XLSM extension. The first time you want to save this workbook (containing macro CurrentDate), the file format defaults to XLSX — and this format can’t contain macros. Unless you change the file format to XLSM, Excel displays the warning shown in the following figure. You need to click No, and then choose Excel Macro-Enabled Workbook (*.xlsm) from the Save As type drop-down list in the Save As dialog box. 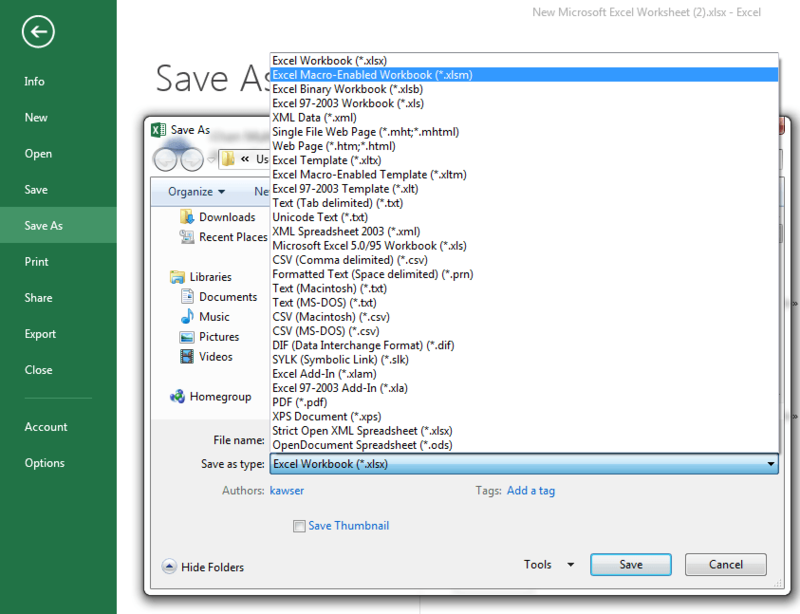 Choose Excel Macr Enabled Workbook (*.xlsm) to save macro containing workbook. Note: Alternatively, you can save the workbook in the old Excel 97–2003 format (which uses an XLS extension) or the new Excel binary format (which uses an XLSB extension). Both of these file formats can contain macros.